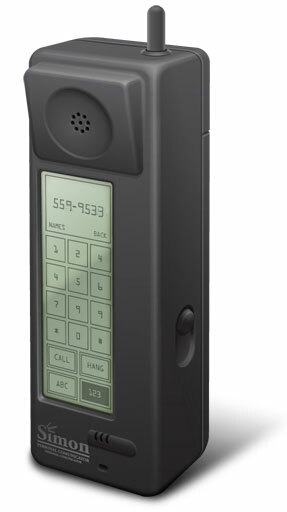 The first smartphone in the world—IBM Simon Personal Communicator—was announced at the COMDEX computer and technology trade show in Las Vegas, on 23 November, 1992. Although the term smartphone was not coined until 1997, Simon's features and capabilities (see the Users Manual of Simon) of a handheld, touchscreen cellular phone and PDA in one device can be referred to as smartphone. The announced in 1992 device with code named Angler, allowed a user to make telephone calls, as well as to work with facsimiles, emails and cellular pages, among other functions. It featured 11 built-in programs, including a calendar, to-do list, calculator, address book, appointment scheduler, world time clock, electronic note pad/sketch pad, handwritten annotations and standard and predictive stylus input screen keyboards. At a cost of $900, Simon (dimensions: 200 mm, 64 mm, 38 mm; weight	510 g) featured a Vadem 16 MHz, 16-bit, x86-compatible CPU. The memory was 1 MB of ROM (read-only memory) and 1 MB of PSRAM (pseudo-static random-access memory). The connectivity was provided by a 2400-bps Hayes-compatible modem. Simon used the operating system Datalight ROM-DOS. IBM created a unique touch-screen user interface for Simon's 114×36 mm, 160x293px monochrome backlit LCD display. Simon's included NiCad battery lasted about eight hours in standby mode and about one hour under constant use. Simon was assembled under contract by Mitsubishi Electric and was distributed by BellSouth Cellular Corp. between August 1994 and February 1995, as some 50000 units were sold. It operated within a 15 state network. 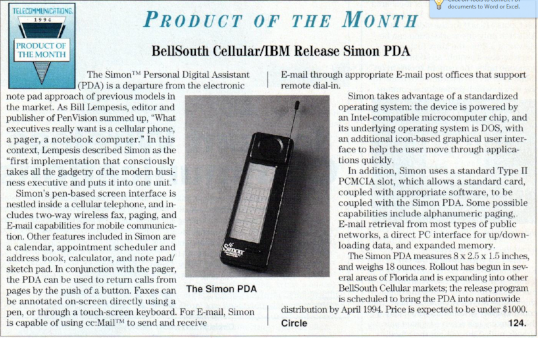 The venerable Simon might seem quite laughable by today's standards, but it was certainly an impressive device back in early 1990s. Anyone want to make a guess at what the phones of middle 2040s might possibly look like?